I used Essie Lilacism as a base, with Eclectic Purple for the stripes, head, and mixed with Essie Lilacism for the tip of the tail, the face and the paw. For the black lines I used Zoya Raven, for the eyes, Diamond Cosmetics #319 Lemon Yellow Zest, for the smile, Sally Hansen All the White Stuff, and for the nose, a mix of China Glaze Salsa and Nubar Milk Chocolate Creme. For the background on the thumb, I used Zoya Dovima. Topped everything off with 2 coats of Seche Vite top coat. There were also times when his voice was like him as j.m. barrie in Finding Neverland, especially when he was pretending to be a pirate in that movie! haha. Here in Spain, we can't watch it until 16th april because Avatar is still selling tickets on cinemas!! I can't wait! I love this!! 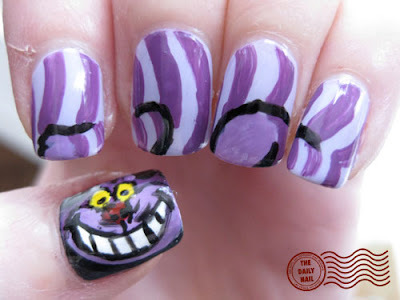 I've been wanting to try doing Cheshire Cat nails. You did a great job. That is really cute! I thought that the Cheshire Cat in the movie was much cuter than in the 1951 version though! Hi! I was deeply interested reading your post until a huge banner popped up on my screen in the middle of the text and now I can't keep reading it! I tried to cancel it but there's no cancel button! Would you please let me know how ca I make it go in order to continue with my lecture? I love your punky nails! I mean your completely mad!